Released as LP in 196? The Music of Laos is part of Rounder Records' ambitious reissue of the complete UNESCO Collection: Anthology of Traditional Music of the World, produced between 1968 and 1987 by Professor Alain Daniélou of the International Institute for Comparative Music Studies and Documentation. This substantial document and the work of Professor Daniélou comprises an important part of the history of the discipline of ethnomusicology, for it is through these albums that many were first exposed to traditional musics from around the world. Though dated, this collection can still be found in many university libraries and has only recently been supplanted from its role in world music courses by the flood of compact discs of traditional music in the last decade. Both for the music contained within, and the associated history, the reissue of this document to compact disc is a worthwhile project. It is with Rounder Records' editorial decision to reproduce the original notes with no additional commentary or updated information that I have serious concerns. The sound material is nonetheless quite valuable, and it is this which I will address first. Laos is an ethnically diverse country, with ethnic Lao living in the lowland regions and many ethnic minorities, such as Hmong, living mainly at higher elevations. This recording features music of the ethnic Lao as represented primarily by those musicians found in and around the capital Vientiane and the former seat of the Lao court, Luang Prabang. This includes music for the khaen, the free-reed mouth organ paramount to Lao musical culture, in solo, ensemble, and accompanying a solo singer. Also included are three pieces from the classical and court tradition which developed in interaction with those traditions in Thailand and Cambodia. The khaen is made of two parallel rows of bamboo pipes, each with a metal free reed, mounted in a wooden windchest. Each pipe produces a single pitch, which is sounded by covering a small finger hole. Thus, many notes may be sounded simultaneously. The number of pipes varies from 6 to 18 but the most common form today has 16. This instrument may be quite old, and is likely related to an ancestor of the modern Chinese sheng. (1) As the instrument sounds breathing both in and out, a continuous sound is easily maintained. Nominally, khaen music has two components: a drone or drones, and a pentatonic melody which is played in parallel octaves, fifths or fourths. This recording includes three examples of the khaen in its most common role in Southern Laos and Northeast Thailand, as accompaniment to a solo singer, called mawlam. Mawlam singing is a rapid melodic recitation in which language tones are rendered with two-note melismas, and the melody is largely improvised. The khaen player provides an improvised accompaniment in the same pentatonic melodic mode as the mawlam. These three examples all illustrate a sparing, non-legato approach to khaen accompaniment which contrasts the continuous, virtuoso style favored in Northeast Thailand. These examples also include alternation between two closely related melodic modes, one analogous to major (G-A-C-D-E) and one to minor (D-F-G-A-C). The relatively rugged terrain of Laos has resulted in regional variations in mawlam singing and khaen playing, but these variations are not represented on this recording. All three examples (one of which is inexplicably titled "Folk Song of the North") appear to be in the lam sithandon style from Southern Laos, which is closely related to Northeast Thai styles. The improvised accompaniment to mawlam singing may also be played as a khaen solo, in which case the player is freed from having to follow the singer and may be somewhat more inventive. The CD begins with a brief but representative khaen solo illustrating the basic techniques of the instrument and relative freedom and virtuosity of solo khaen improvisation. Included also are three pieces supposedly for two khaens, though it is less common for the khaen to be found in ensemble combinations. In ensemble, the music is less improvised or not at all, as improvised khaen parts would quickly blur into an almost constant sounding of all notes. Solo khaen "pieces" are more aptly described as improvisations within a given style or improvisations based on a fixed melody (the latter case is not represented on this CD). The three duos on this CD sound just like solos, and are either composed versions of solos played in astoundingly precise unison, or solos incorrectly described as duos. The quality of the recording makes these two possibilities difficult to distinguish, but in any case those tracks are representative of khaen solos in style. More recently, with the institutionalization of education both in Laos and Thailand, large khaen ensembles have been formed for many students to learn musical basics. These ensembles play in unison, and may play composed versions of khaen solos or arrangements of classical repertoire. The latter case is heard on this CD, with flutes and typical classical unpitched percussion (drums, handbell) included, playing a composition in a Chinese 'accent', Paeh Sam Chan, by Thai composer Luang Pradit Pairoh. The unfortunate liner notes mysteriously title this piece only "Pure Music (ping-pe)". 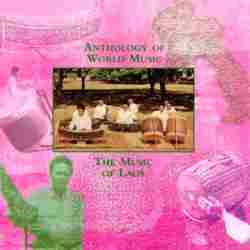 Not represented on this recording are cases of solo khaen being included in a classical ensemble to perform popular classical music in Laos, as heard on the recording The Songs of Lao (World Music Library, 1997), or in Thai classical music to perform compositions in a Lao 'accent'. There are three examples of Lao classical music on this recording. This music developed both inside and outside of the courts, but due its association with the courts was eliminated in Laos in 1975 when the Lao People's Democratic Republic was established. After 1980, classical music was gradually restored in Laos and may occasionally be heard today, often with khaen included. (2) The examples on this CD do not include khaen, however, so I will not discuss them here. They are now precious documents of a largely extinguished music, though its close cousins are maintained in Cambodia and have flourished in Thailand, and are readily represented on numerous recordings. As stated earlier, the decision not to update the liner notes from the original albums makes this a seriously flawed document. The dramatic political and social changes which have taken place in Laos since the original album was produced make this particular volume especially out-of-date. Furthermore, there are many minor flaws in both Rounder Records' packaging and the original notes in addition to those mentioned earlier (e.g. pictures of instruments which are not heard on the recording, or discussion of the Royal Court and Royal Court Orchestra in the present tense even though it no longer exists, even on the album cover). My two major concerns, however, are the lack of historical and cultural background (out-of-date or not), and the comparative approach used to discuss the individual tracks, whereby nearly every track is described as having derived from Indian music or even as being in a melodic mode analogous to a given Hindustani rag. Both of these weaknesses are indicative of Professor Daniélou's perspective, his era and the context of this project. While these are useful to examine, and while an ethnomusicologist may recognize the particular historical position of this document, the average consumer (who I am assuming to be the World Music teacher or the curious listening public) may not. For them, and without further research, this document may be severely misleading. While Rounder Records should be applauded for reissuing this collection and reproducing the original liner notes in full, I can see no reason why the notes could not be supplemented with newly-written commentary that would explain the historical position of this document and provide up-to-date history and context for the musical subject. Between the numerous Smithsonian/Folkways recordings and the recent reissues of the first recordings of Balinese music, The Fahnstock South Sea Expedition: Indonesia (Rykodisc, 1994) and the impressive The Roots of Gamelan: Bali, 1928 (World Arbiter, 1999), there is ample precedent for the release of well-annotated historical recordings which can be of great value to ethnomusicologists, teachers, students and casual listeners alike. This is especially important in the case of Lao music, about which there is almost no printed material, apart from the Southeast Asia volume of the Garland Encyclopedia of World Music. Despite my concerns about the inadequacy of information in this disc, any contribution to the modest handful of recordings of Lao music currently available is a valuable addition. While there are a few recordings of mawlam and khaen music from Laos currently available, most suffer from rather poor liner notes except the out-of-print Music from Southern Laos (Nimbus, 1994). Due to political circumstances, there are more recordings of mawlam and khaen music from Northeast Thailand, and many more well-annotated recordings of the Thai and Khmer classical/court music traditions which are closely related to the former Lao court tradition. (1) Miller, Terry E., "Free-Reed Instruments in Asia: A Preliminary Classification," in Music East and West: Essays in Honor of Walter Kaufmann, ed. Thomas Noblitt (New York: Pendragon Press, 1981), p. 93. (2) Miller, Terry E., "Laos," in The Garland Encyclopedia of World Music, volume 4: Southeast Asia, ed. Terry E. Miller and Sean Williams (New York: Garland Publishing, 1998), p. 354.